Salici IGT Terre Siciliane - Baglio di Pianetto Offer | Saporidoc UK. 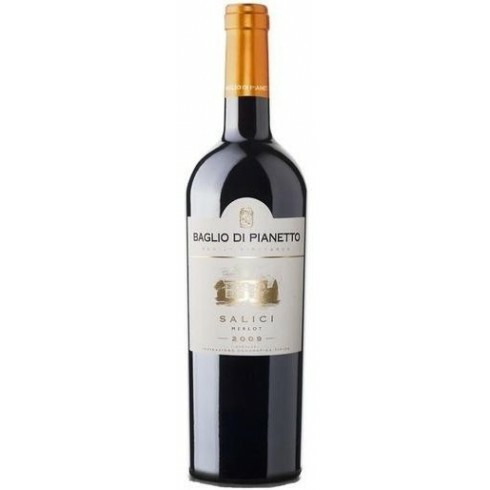 2007 Salici from the ambitious and innovative Sicilian producer Baglio di Pianetto. An elegant mature high altitude Merlot wine from the mountains south of Palermo. A great international grape adapted to the Sicilian mountains. Pairs with Pasta dishes, tasty meat dishes and medium aged cheeses. Serve at 16-18 C.
The vines for the Salici grow in the Santa Cristina Gela vineyard at around 650 m. altitude at Baglio di Pianetto Winery in close proximity to the city of Palermo. The grapes were harvested by hand in the early hours of the morning after which the grapes were left to rest for a few hours in the cellar in special rooms with controlled temperature. Merlot makes a traditional fermentation with fulling and delestage. After fermentation the wine was aged in new oak barrels of small capacity, where malolactic fermentation takes place and remains in sur-lies for 16 months with regular checks. After this followed a long ageing in bottle before being released for the market. On the whole this wine expresses all the particular characteristics of the different terroir and it can be considered a Sicilian wine with an innovative complexity of character. Colour: Deep ruby with garnet fleshes. Bouquet: Hints of jam that recalls cherry and prune followed by complex and intense spicy and balsamic notes. Taste: On the palate it is mellow and well balanced with a long and persistent finish.